"So sorry to hear of Bill's passing. We went through high..."
"I worked for REV. SHOOK FOR MANY YEARS AND HE WAS A GOOD..."
Shook, Rev. 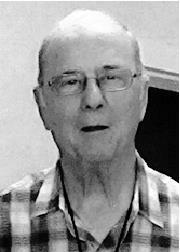 Bill L. 78, retired American Baptist Estates, Prairie Homestead, Administrator and American Baptist Minister, passed away Wednesday, Dec. 19, 2018. Visitation 2-4:00pm, Sunday, Broadway Mortuary. Celebration of Life 1:30pm, Monday, Prairie Homestead Chapel, 1605 W. May. Burial will be private. Preceded by wife, Carolyn and parents, William and Opal Shook. Survivors are daughters, Debra (Ronald) Ruhulessin, Diane (Mark) Hull; son, Steven (Vickie) Shook; 9 grandchildren and 5 great-grandchildren. In lieu of flowers, memorials to Prairie Homestead. Share condolences at www.CozineMemorial.com. Broadway Mortuary.